Could this be device that breaks Apple into the business market? Will the suits and office workers of the next five years be pulling iPads out of their briefcases? Yes argues blogger Matt McHugh brought to our attention in a Shiny comment. McHugh imagines an iPad-enabled office: his scenario – instead of getting a desktop in the office and a work laptop to drag around, your company spends £500 and gets you an iPad, you dock it at work and it’s locked to your work server. Makes sense huh? He also points out that this increases security so if you break, lose or pour coffee over your iPad you can just re-download all the company’s data and software onto a new device. And of course it costs less for the company to replace. 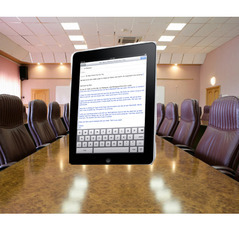 “The iPad is a secure, mobile, wirelessly tethered computer perfect for a business user’s daily needs. And, people love using it because it’s cool and simple.” Matt says. A model like this would work in universities or schools as well. On the downside, I think that offices want something a bit more advanced than iWorks on their everyday computers. Like Excel? Depending on the work they’re doing, they may want more powerful chips as well. That 1ghz processor won’t handle high-power programmes very well, and as for not running more than application at once, that’s a bit of killer: couldn’t have twitter, your email and safari open at the same time. Maybe when we hit iPad 3.0 this will be feasible. In the meantime that model is only possible for offices doing simple work. Ipad is a good looking and high end devices we can use it because it fast,touch is great with lots of things to do. It’s really beautiful work.Thanks for this kind of stuff.I mean I am totally impressed.Hope to see more updated work here.I have to say, it is very informative. Business can be transacted anywhere nowadays. Time is money as considered today. Every tick of the clock must be equivalent to an earning. This post is essential. Actually iPad is business gadget not ordinary gadget.It has some special features which business class easily to used and understandable. iPad is one type of Palm. It can use as the alternate of notebook whre I can chat, mail, internet browse, making document etc. Samsung has also a device called called Galaxy Tab. It has not be compared with apple iPad. iPad is iPad. I was nearly rolling around the floor with that one. What a Joke. perhaps the HP / MS Tablet yes. but the Ipad. never. The Ipad is not a business machine. it does a poor job.